I started singing as early as I can remember. At first, it was all about Whitney Houston and then Mariah Carey. As I got older and learned more about music, I gained a deep appreciation for Classical music. I really love Classical piano. After I graduated from high school I was attending college and going to go into musical theater, but the Opera theater director at my college snatched me up and said I had a great voice for Opera, so she introduced me to great singers including Maria Callas, Joan Sutherland, and Mirella Freni. I tried to emulate their sound. In the last 15 years, I have slowly started listening to a lot of Jazz including great artists like Ella Fitzgerald and Sarah Vaughan. Those were big Jazz vocal influences for me. What is/are your favorite song(s) you've helped direct at RiverCity? I have really enjoyed the 80s tunes during last season’s program - it’s music I grew up with. Currently, it’s nice to help out in the 90s program and help others performing ‘Electioneering’ by Radiohead. RiverCity Rock Star Academy offers kids and adults a mini-community for music. Right now I’m listening to a lot of Soul, Bro Soul, Funk, and Hip Hop. Artists like Erykah Badu, Fela Kuti, India Arie, Jill Scott, Childish Gambino. I went to art school for a summer and I paint and sketch. I lived in England for a year when I was pregnant with my first born. I’ve had all kinds of weird jobs - mostly as an administrative assistant (over 10 years), and I’ve worked on a farm, worked as an after-care counselor, worked for coal lobbyists (yikes), and sang in the Florida Grand Opera Chorus. My boyfriend and I are currently working together in a band called ‘The Difference’, it’s a Funk/Soul/Rock kind of group. But we are also trying to piece together a Rock Opera. I’m also, most importantly, a mom to my two kids (Julian 11 and Emelina 8 months). 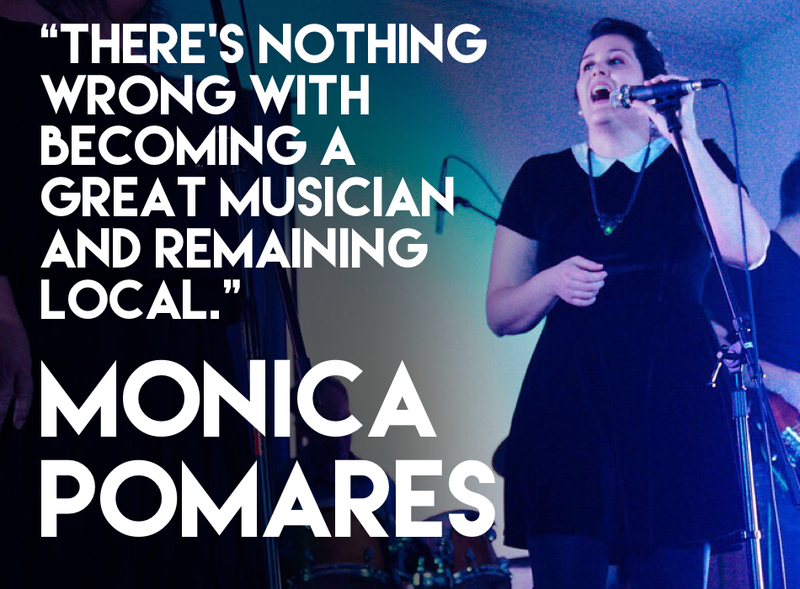 Monica is available for vocal and keys lessons. Contact RiverCity to schedule your free trial lesson and tour. Staff of the Week - Brian Hart! Tell us a how you became involved with RiverCity. I had heard of RiverCity since they started, but I officially met Mark (co-founder) during the first Make Music Day Salem. I loved what they were doing and I felt like I had to be involved so when Mark asked me, I jumped at the opportunity! What’s your favorite thing about RiverCity? Such a hard question. I love everything that they do! I love that they give kids another option besides choir or band classes. Teaching kids rock n’ roll is the best thing possible. I really wish RiverCity was around when I was in school! I love the family atmosphere and how open they are to every age and skill level. The RiverCity team amazes me every day and I am lucky to be a small part of the magic they create! What are some bands or artists you are listening to right now? At this very moment, I can’t stop watching Childish Gambino’s “This is America” video. My favorite bands of all time are Led Zeppelin, Pink Floyd, and The Beatles. I love absolutely every genre of music, even the weird stuff. Well, except country, still not the biggest fan of most country unless it’s Johnny Cash. What are some other community projects you’re involved with? Born and raised in Salem I consider myself a strong advocate for my beloved community. I am the chair of the Salem non-profit, The Moxie Initiative, a co-curator of TEDxSalem.us, vice chair of the Huggins Insurance Services Inc., a volunteer committee member of Make Music Day - Salem, do graphic work and guest host on the Reel Film Snobs, I co-host/produce Cool Sheets, a radio podcast on KMUZ 88.5 FM and I volunteer at the Sundance Film Festival for 15 years and counting. In 2011, I was voted as one of the top 20 under 40 in Salem and have been trying to live up to that honor ever since. What is your ‘day job’ (besides posting cool things about RiverCity on social media)? I work full time as a video producer at Allied Video Productions. What is something unique about you that people might not know about? I love plants! I have 23 of them in my small one bedroom apartment. I also make my own laundry soap, I like to cook, run and I have been car-free for over four years (I ride my bike or walk everywhere). I’ve also explored many different spiritual adventures including a 10-day silent Vipassana meditation retreat and a journey to the Amazon jungle in Peru where I hung out with a shaman. Basically, I am just a big hippie. Contact RiverCity to schedule your free tour and trial lesson today! Staff of the Week - Mark Green! You’re the co-founder of RiverCity Rock Star Academy. Tell us a little about the musical journey for how RiverCity started. Music has been a constant force in my life since early on. Music was always playing at home and at family gatherings and both sides of my family have many talented musicians. Although personally my attempts at being a musician stopped about 9th grade, until I picked it up again a few years ago, however my daughter has always been involved with music, so it is still an important part of my life. Salem and the surrounding areas have a tremendous amount of musical talent, especially at the middle school and high school levels (evident by the numerous competition awards). What we realized is there was no place in the area for young musicians to come together and play music together, beyond the school music programs. That’s when my wife Karen, daughter Danielle and I decided to develop a business plan and check further in to starting a music school in Salem. That was over three years ago and I’m so happy to say we have grown from a school of 14 students in our one teen program, to over 120 students of all ages in seven programs (plus private lessons, workshops and summer camps). It’s been a great musical journey so far and we have more in the works! I love the community and culture that has developed at RiverCity. It’s great to see students at RiverCity support each other musically and become friends and do things together socially outside the studio. Music is a great thing to bring people together. I am also so proud of our talented students and the talent and dedication by our great teachers. The support by our RiverCity families and community has been amazing. If you could offer any advice to someone considering playing music, what would it be? Don’t think too hard about it, just do it! Because I personally chose sports over music when I was in high school, it was something I regretted. But I’m glad I was able to pick it up again when we started RiverCity (a reaction we often hear from many of our students in the Renegades [adult] program). And play with other people. One of things that’s great about RiverCity is students begin learning and playing songs together with their ‘bandmates’ immediately. It’s never too late (or early) to learn music. So much music to list. First of all anyone that knows me well that music is literally on 24 hours a day and usually playing loud. I also listen to every type of music and genre and will go down some major deep dives into a time period, band, or type of music. Some of my recent listening binges include Bleached, The Regrettes, Widowspeak, Jay Som, Natural Child, TwoTens, Red Fang, 20/20, The Shoes, The Pretty Things, 60s Bossanova, Teena Marie, every Rolling Stones album, Herbie Hancock, Iggy Pop, George Jones, French Pop, Parliament, Big Star, John Coltrane, Sparks, Kinks, and of course Lloyd Cole. Make Music Day - Salem (www.makemusicday.org/salem/) is my major community project at this time. I was fortunate to work with some local folks who wanted to bring a large community event to the Salem area. Make Music Day (MMD) was a perfect fit. MMD is an all day, into evening event held in over 700 cities worldwide every year on the summer solstice, June 21st. It’s a day of free music outside of restaurants and businesses throughout downtown Salem and the surrounding areas, performed by bands and individual musical artists of all ages and skill levels. This will be Salem’s third year hosting the MMD celebration and there are over 100 bands and 35 venue host locations already signed up. We love that our RiverCity program students have the opportunity to perform at MMD, as well as many of our teachers who will be playing with their own bands. What is your ‘day job’ (besides running a rock music school)? I am a family business consultant that works with all types of family enterprises around the West. I help family businesses with strategy, communications, succession, governance, and professionalizing their business. I also run a research/education institute called the Pacific Family Business Institute with my partners in Seattle. We conduct surveys and host seminars for family businesses and professional advisors in Oregon and Washington. We just completed a survey of over 80 family businesses and their board’s CEOs and governance practices that will be published next month. What is something unique about you that most people don’t know about? I am doctor but not the real kind (Ph.D. not a M.D. ), as my family reminds me all of the time. I have spent the majority of my adult life either going to college (Bachelors, Masters and Ph.D.) or working at a college as a faculty member, administrator or a researcher. Yet my dream class to teach would be history of rock n’ roll. Mark is available to talk more about RiverCity Rock Star Academy. Contact RiverCity to schedule your free tour and trial lesson today!